One of the sets of rules that I wrote during the development of my original PORTABLE WARGAME rules were called ITCHY AND SCRATCHY. They used a combat system based on an idea that came from Archduke Piccolo, namely relating the arrangement of the pips on a D6 die to the standard NATO tactical map signs. 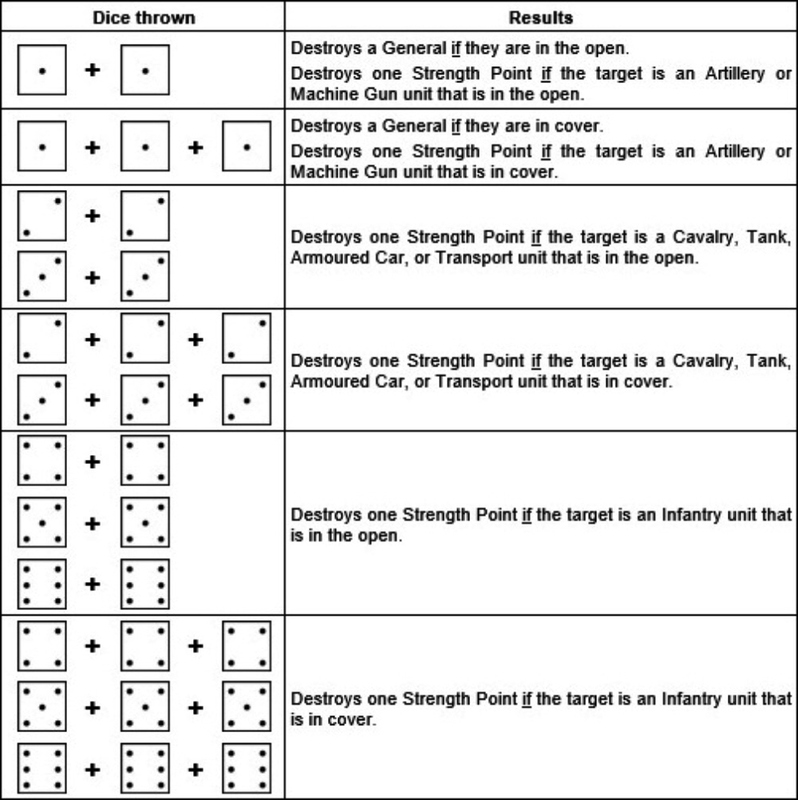 The number of D6 dice thrown by a unit depends upon the range the units is firing at. The numbers show how many D6 dice are thrown at different ranges. The asterisk (*) indicates the number of D6 dice thrown in Close Combat (i.e. in combat with an enemy unit in an adjacent or the same grid area). Thus, an Infantry unit firing at an enemy Cavalry unit at a range of 2 grid areas throws 4 D6s. 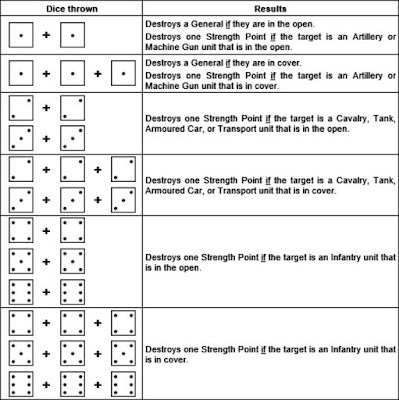 If the D6 dice scores are 2, 2, 5, and 6, then the Cavalry unit is hit. Had the Cavalry unit been in cover, the unit would not have been hit. I'm not sure if this will work any better or worse that the existing PORTABLE WARGAME combat systems, but it has given me some food for thought. The downside seems to be having to throw a larger number of dice in many cases, whereas the simplicity of the PW one dice plus/minus modifiers to hit and one to determine effect remained constant. Relating the die spots to tac symbols is clever, but is it worth sacrificing a simple, standardised system? Good to see PNV selling so well - not surprising, really. PNW is selling better than I expected, and the feedback has been very positive. Making a PDF edition available to buyers seems to be popular, and I may well publish a compendium of the earlier books in this format at some point. Ah! Never thought of that! I have been using the 'symbolic' system for the Vales of Lyndhurst campaign, but with some of your own PW ideas incorporated (e.g. 2-2 = retreat OR lose 1SP; and 3-3 = mandatory loss of SP. I like your suggestions in respect of cover. I had simply been reducing the combat dice from standard, rather than increasing the criteria for damage. I do like your 20th Century system. I'll have to give it a try, but I am inclined to think that my suggested 'retreat' options might add a little something. I haven't tried it, but it will be something to look forward to! Thanks for your very interesting thoughts, which take the idea further than I had even begun to think about. At present all I'm doing is thinking (which is no bad thing!) as I am trying to get some of my 20mm-scale figures renovated, doing research for a Masonic history book, and living in a cold house whilst a new boiler is being fitted! Add the extra spice of normal living and I don't seem to have the time or the inclination to wargame. Good luck with the house painting ... and I look forward to reading more about your Vales of Lyndhurst campaign.